Designed for automatic bag forming filling and packaging for various big powder bags, such as flour, milk powder, grain powder, chemical powder, medical and Chinese herbs powder etc. Related Products Name: Flour Packaging Machine, Milk Powder Packaging Machines. 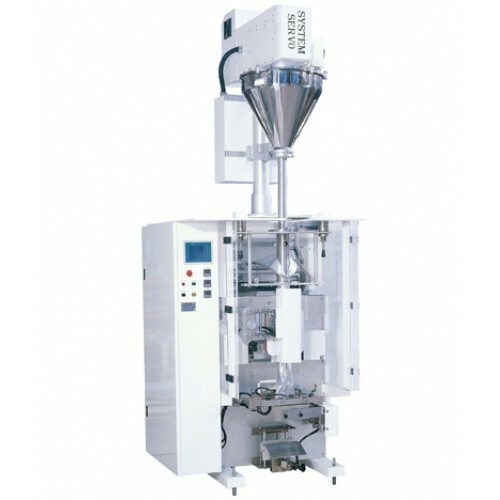 The Form Fill and Seal Packaging Machine - CC-1205 automatic bag forming filling metering packaging machines are suitable for all types of free-flow and non free-flow powder and granular products. The machine is designed with an air operated sealing mechanism, ensuring smooth appearance of product without pin-hole problem. No material exists at sealing position that assures superior tightness of sealing. Printing points photocell sensor is easy to adjust to eliminate waste of packaging film. Simply inputs packaging length in case of no printing points photocell sensor. Minimum sealing temperature variation. Employ PID calculation to maintain temperature tolerance within ±2°C. Product types and weights can be memorized for added convenience of management. The transmission system is driven by a servo motor (Mitsubishi from Japan) for high accuracy. The control system employs a touch-sensing screen for operational convenience. All air cylinders employ Japan (SMC) standards for dependable quality. The controller provides a self-diagnostic function. In case any machine trouble occurs, such as no packaging film, no color tape, photocell sensor error, excessive or under sealing temperature or air pressure failure etc, the machine will stop automatically. The screen will display problem points and trouble-shooting instructions. The machine is available to be connected with initial material system. The machine is available to equip with a corner insert vertical bag device.